Dr. George Sargiss received his bachelor’s degree from Villanova University, his dental degree and orthodontic certificate from NYU, and completed a hospital residency at Cornell University. He is a member of the American Association of Orthodontists and serves on the staff at CentraState Hospital. Dr. Sargiss was named a Top Orthodontist in New Jersey Monthly’s 2016 survey of New Jersey dentists for the eighth consecutive year. The results of the survey appear in the July 2016 issue. He was also selected as one of “America’s Top Dentists” by the Consumer Research Council for the ninth consecutive year. Dr. Sargiss was voted one of NJ Family Magazine’s “Kids’ Favorite Docs.” Along with all our doctors, he is recognized as a Super Elite Invisalign® Provider, which places him in the Top 1% of all Invisalign providers. 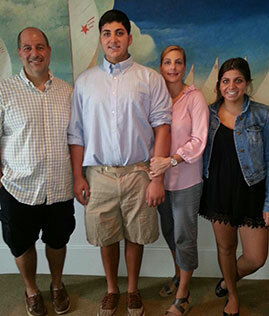 Dr. Sargiss loves to play basketball and spend time with his wife Marian and two children, Christina and Alex. He still dreams of his days on the football field at Villanova.